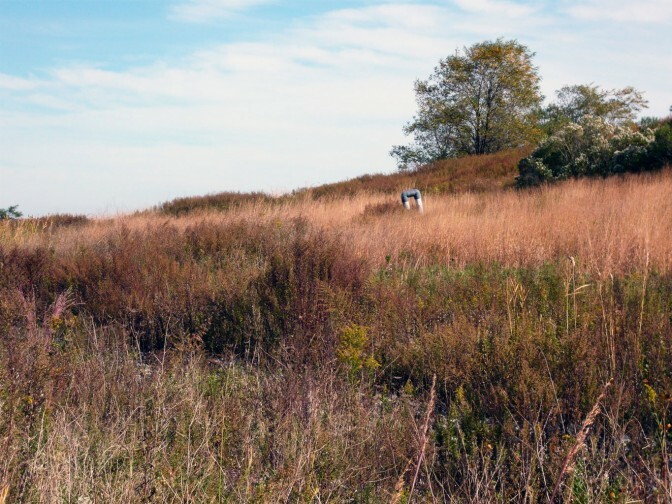 The wide, open grasslands of Freshkills Park serve as an important habitat to a variety of wildlife. One species that depends on these areas is the American kestrel – the smallest member of the falcon family. These birds nest inside cavities of isolated trees scattered throughout open fields, and feed by swooping down to capture prey among the grasses such as large insects or small animals. As with other grassland birds in the Northeast, the kestrel’s numbers have been decreasing in recent years, since their ideal habitats are disappearing or becoming fragmented as a result of human interference. 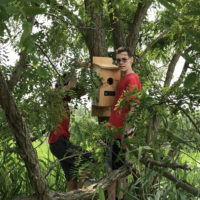 To help boost kestrel numbers within the park, high school student James Tonrey decided to build and install kestrel boxes for his Eagle Scout project. 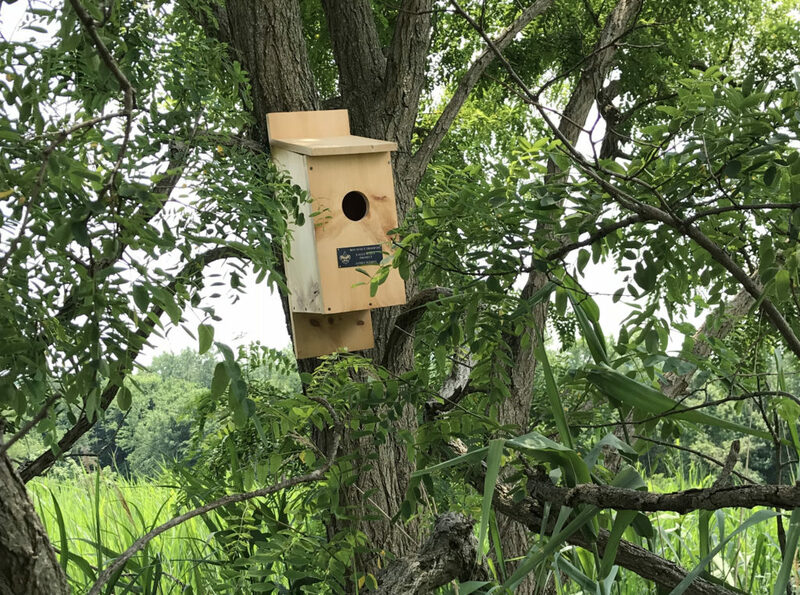 Kestrel boxes are used around the country as a way to study and monitor the species and provide habitat for them to nest in. Each box is a small wooden house that can be mounted to a tree, with a 3-inch diameter opening in the front. They are usually attached to trees or posts at about 10 feet above the ground, and each box is placed about a half-mile apart to account for the territories of individual families. James and a group of Boy Scouts built these boxes themselves, each one complete with a plaque identifying their troop number. 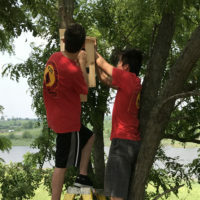 On Monday June 18, the troop visited Freshkills to install nine of these boxes throughout North and South Park. Once they chose the trees on which to place the boxes, the Scouts would lean ladders against the trunks and climb up to wedge the box between branches, using paracord to tie them securely in place. After about an hour and a half of hard work under the hot sun, all nine of the boxes were successfully installed and ready for kestrels. Many thanks to James and the Boy Scouts for leading this important and exciting project!